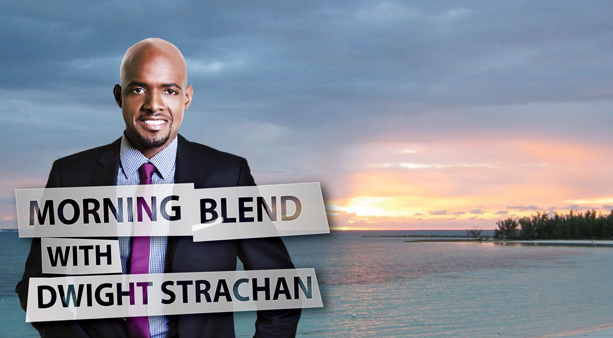 Morning Blend with Dwight Strachan is the weekday morning news and talk radio show on Guardian Radio 96.9. Unlike anything currently on Bahamian morning radio, the show aims to give analysis and opinion on a wide range of topics, including local and international news, politics, sports, health and entertainment. With its panel format, featuring Dwight Strachan and his various guest co-hosts, the program aims for more humorous and less formal and somber perspectives on the issues of the day. However, backed by the resources of The Nassau Guardian, it will still offer in-depth reporting and analysis, and breaking news. Listeners can expect a fast-paced show with a variety of different topics each day, as well as interviews with newsmakers, and with the people who report on the news. Morning Blend is a source of business and consumer news, weather and traffic updates. Regular segments include “The Overnight” (late-breaking headlines on developments nationally and internationally), “In The News” (discussions on hot topics), “Morning Business Report” (local and international business and consumer information), and “The Final Half” (entertainment news and issues at 8:30am –the final half-hour of the show). Morning Blend airs Monday through Friday from 6am to 9am. With experience as a television and radio producer, director, writer, on-air personality, and programme developer, Dwight Strachan has developed his skills in and out of the recording studio, and on both sides of the camera. Dwight is a communications professional with 15 years of experience in media. He began his career as a print journalist before landing a role as news editor and anchor at a Nassau-based Top 40 radio station. In 2001 he joined Bahamas@Sunrise, The Bahamas’ only live morning television show, and has served as producer and head writer for ten years, overseeing script development and managing the on-set activities of the show’s broadcast personalities and production staff. In this role Dwight was instrumental in a number of firsts in Bahamian television including concept design, production and editing for two nationally broadcasted reality TV competitions. Dwight is passionate about the history and evolution of television and film, including classic programming, scheduling, demographics and ratings analysis. He is also an automobile aficionado, and enjoys running and cycling. He is a classically trained pianist with a working knowledge of French. Dwight holds a Bachelor of Arts degree in Broadcast Communications from Barry University. You may call Mr. Eric Carey at 396-0150. We are listening and would like to make a comment. Please grant me the honor of being your special guest on the ‘Morning Blend’ to discuss the impetus behind my new 305 page book, ‘The History of the Saxons Junkanoo Group 9The Early Years)- Stories of a Forgotten Bahamian Culture’. Visit my website: http;//www.bahamasjunkanoobooks.weebly.com for more info. I turned on your show this morning around 8:35am right about the time you began to introduce your guest. I was so excited to hear he was an author and the book title sounded so interesting. It was almost like I was listening to NPR. Then about two roundabout’s later when the conversation turned to men’s punctured ego’s and women who use their power to “degrade” their men, my stomach started to turn a little. All of a sudden I noticed the lack of a female voice in the conversation and to be honest I had to change the station. I am personally a proponent of an egalitarian dynamic in a relationship and a firm believer that there is no one right kind of woman or man. Couples need to be able work out for themselves what works for them. So that if there comes a man who is intimidated by the woman he is with then we must realize that there is nothing wrong with the woman, but that he is with the WRONG woman! I have to admit, not being able to stomach the conversation any longer I did not listen after 10-15 mins so I don’t know where it led. But I must say, what I heard was not becoming. I will immediately grasp your rss feed as I can not to find your e-mail subscription link or newsletter service. Do you have any? Kindly permit me recognise so that I may just subscribe. Thanks. I hope and pray guardian radio stays on the air! Stay up, Stay strong, and Keep it moving. Positive Journalism is under pressure worldwide. “Filth” I don’t agree. Very timely topic. Can you asked your panel about business plan development assistance for start ups? Why aren’t banks and NGOs doing this? It would help new businesses to become successful! GM Dwight, Mr. Neymour is a typical defunct politician! He sings a good song now that he’s not in office, but while in office he too wasn’t “in touch” with “the people”! He was extremely arrogant, as was most of them! Let him know that is why the FNM lost!!! I could never vote for him again!!!!! We must build our education system on a future trends model. What’s the next “thing” in terms of industry and economic diversity? Bahamas Foreign Direct Investment, (BFDI)instead of (FDI) Foreign Direct Investment; joint ventures is the new model. Empower, employ Bahamians in green energy agriculture, fisheries, (food security) and technology etc. Training and direct ownership through open capital market access for investment financing is the way forward to complement industries that already exists; tourism, banking, construction & maritime. We will also need small business assistance programs in business planning, reduce accounting and legal fees for start ups. I agree with Alesha 100%!! If the Government is having difficulty meeting its bills, what do they think of the populace?! No comprise for Education and Healthcare!!!!!! None!!!!!!! i am very disappointed in my prime minister this morning. he let this referendum be turned into a religious and political football all because he didnt want to make the decision himself. it is a fact that thousands of bahamians gamble even many of those who voted no. he let the numbers industry fend for themselves even after they donated millions to him and the church. numbers bosses bet heavily on the plp and lost. if they had supported the fnm and the fnm had won HAI would have never left them to the wolves. now he has painted himself into a corner either closed down the web shops and alienate a major campaign donor or leave them open and look like a fool. if it is one thing i hope people take away from this is that politics is a dirty game and people say anything to get in and once they in dog eat ya lunch cause ya on ya own. the prime minister ride the horse into election then set him loose and say he aint gat no horse. WOW. SWIFT of punisment would minimize anti-social behaviour. it [death penalty] is not meant to be deterent but is a direct consequense for an action. if nothing else, people would think twice, three times before wrongdoing for the knowledge that if caught , they will be punished each and every time. As a school counselor I can see their will also be adverse effect on children of parents who gamble. Please look at http://gamblinghelp.org/ for help with perons with complusive gambling. This professioanl is right on que with this problem. They are hardly worth celebrating on “merit”, it is a part of our history that we should EXPLOIT. Tourists around the world are fascinated by pirates and the culture and history there and The Bahamas played a major role in pirate history. We have barely scraped the surface of the potential business opportunity there. One example: two of the Pirates of the Caribbean films were shot in The Bahamas. We should have capitalised on that fact, bought all of the sets and costumes and props and created a theme park around it. What a missed opportunity! Great show guys, i really enjoy the topics, hosts and their views. This issue of numbers is a ball of confusion and we are being sold something when it’s really something else. Gambling is Gambling is Gambling. Mr. Bastian of We Care was not as forthcoming with his comments as he should have been. The number houses are operating full scale casinos not just number buying just that it is electronic. I can play Blackjack, Roulette, Craps and other casino games through the number house website. So the only difference will be if they are legalized is that I won’t be able to go into Atlantis casino and do the same thing in person. Why will we continue with this madness with going halfway by limiting the legalization to number houses. Tuesday morning show with Dr.Dwayne Thompson was great.I’M waiting for it to be published or produced as a clip. The information shared was very inlighting and needs to be shared and promoted throughout our country. Thanks guys keep up the good work!! I was curious about getting into contact with the doctors who were on your show talking about disabled Bahamians. Specifically, the statistic that 30% of Bahamians are disabled. I’d like to know where that statistic came from. If there is an email address or number to reach them at I’d really appreciate it. Thanks. The topic was actually Autism in the Bahamas, and Dr. Michelle Major with the Caribbean Center for Child Development said that although there weren’t definite numbers, estimates suggested there may be as many 7,000 people with Autism in the country. Dr. Major says on average she’s diagnosing about one person a week with Autism in her practice.